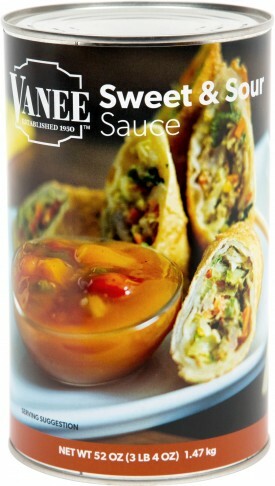 Vanee Sweet & Sour Sauce is a velvety, sweet, and slightly vinegary tomato-base with real chunks of pineapple, onion, and peppers. A classic sauce for chicken, pork, meatballs or vegetables, Vanee Sweet & Sour Sauce is shelf-stable and has no high fructose corn syrup. Each 52 oz. can has 21 quarter-cup servings, for a total of 252 servings per case. Great for stir fry. 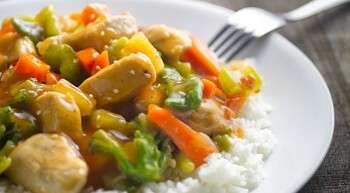 Also serve as topping for meatballs, pork chops, chicken, rice, or pasta. Water, Pineapple (Pineapple, Pineapple Juice, Citric Acid), Sugar, Tomatoes (Contains Tomato Juice, Calcium Chloride, Citric Acid), Brown Sugar, Food Starch - Modified, Onion, Vinegar, Tomato Paste, Green Peppers, Salt, Enriched Wheat Flour (Wheat Flour, Niacin, Reduced Iron, Thiamine Mononitrate, Riboflavin, and Folic Acid), Corn Oil, Natural Flavor, Soy Sauce [Water, Wheat, Soybeans, Salt, Sodium Benzoate(Preservative)], Onion Powder, Spice, Garlic Powder.